That was a great explanation of a useful technique. Thanks. Nice post! Ill be adding your blog to my list. Very good post, just the stuff I needed for my new game. These two articles were fantastic, your effort is much appreciated. I’ve been approaching a related issue and encountering many issues you’ve mentioned. I switched to a pure vector field model for most avoidance and pathing, and I’ve been struggling to recapture the expressiveness of dumb steering ever since. This technique helped me consolidate my plans, and the whole endeavor seems far more approachable. Thanks! I enjoyed this post. (More so than the first in this series, see my comment there.) I once had tried simple experiments with an approach like this, dividing perception of a 2d environment into angular sectors to allow spatial reasoning, but I did not pursue it very far. So it is nice to read about your well thought out approach to steering based on this concept. However in the previous article, you described ways of addressing what you characterized as shortcomings of simple steering behaviors. Then you criticized those approaches by saying: “not only has your hunting behaviour become an order of magnitude more expensive, it’s also become aware that such a thing as obstacles exist.” So I am struck by the fact that (a) instead of returning one value, your context behaviors return 8 or 16, and (b) your behaviors are aware of both goals and dangers. I understand that the value 8(/16) is just an example, but in any case, it is about an order of magnitude more data to compute. Note also that in the context of 3d motion, the number of angular samples needs to be significantly higher, adding even more computational expense. 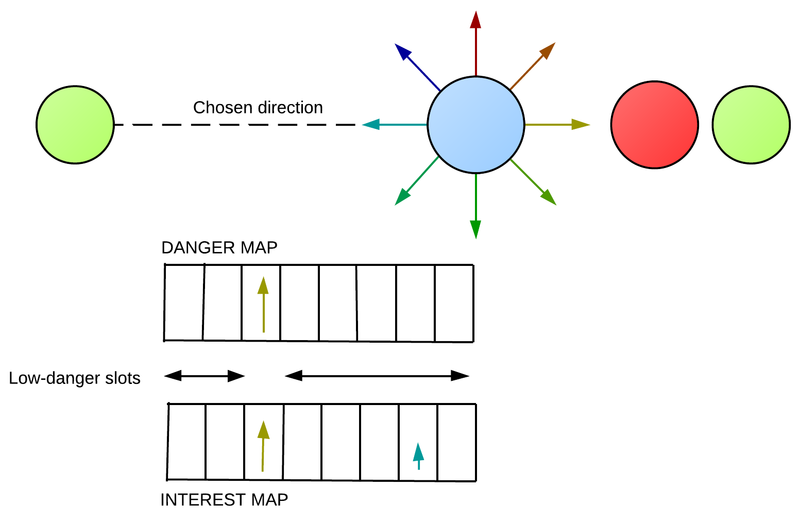 If your context stores a danger and an interest map for each entity then I do not understand why you state your behaviours are stateless. You moved the states from the behaviours to a centralized system but it seems to me these are still behaviour states, nicely encoded to 1D arrays. The maps are not state for the behaviours, because behaviours only need to write to maps, not read from them. The behaviours have input (world state) and output (danger and interest). This makes the majority of the behaviours small, functional, readable and maintainable. The behaviour controller has state, yes, but because it’s isn’t dealing with the specifics of the problem domain, just the generalities of the two maps, it too can be quite simple. Thanks for you prompt answer! I wrongly understood these maps were also used as inputs for the behaviours to compute hysteresis, which upon relecture is clearly at the context level. Really interesting stuff, thanks for posting! I’m having trouble understanding how this approximation of the gradient would be achieved (or I’m not understanding why it would give a different result than the ‘straight’ direction with the lowest danger/highest interest). Could you elaborate a bit on this part of the process? I’ve written a chapter for the upcoming Game AI Pro 2 (http://www.gameaipro.com/) about context steering, that goes into more details. I hope if you read the paragraph again and look at this image http://imgur.com/BNuaEgw, it’ll help you understand things? Thank you, the diagram is useful. If I’m understanding correctly you find the intermediate point (highest point on the gradient) by calculating a weighted average of the nearby slot values. Is there a ‘correct’ way to figure out how to weight the neighbour slots when doing that calculation? Apologies if this is very basic stuff. The book looks like it’s going to be useful, i will keep an eye out for that. Thanks. Fantastic! I’ll study the spreadsheet. Thanks again for taking the time. I am adding this method to my steering behavior library (https://github.com/ClickerMonkey/Steerio) – thanks for the cool idea! I’m implementing the system a little differently – since my library is designed to be dimensionally ignorant – implementing with slots is not an option. I’ve decided to use the dot product instead to determine how closely two vectors are pointing in the same direction (when both vectors are normalized, 1=same, 0=perpendicular, -1=opposite). I use this result to scale the vectors back the more “bad” vectors are pointed in the same direction (swap the logic when looking at bad vectors). I still use summing of the resulting vectors, but I end up with bad & good vectors in the same direction just canceling each other out.